Michael Lund Petersen’s MUCHO GUSTO left little doubt as to who was best in the $147,351 Robert B. Lewis Stakes (G3) at Santa Anita on Saturday. The Bob Baffert trainee always traveled like a winner and finished 4 3/4 lengths clear under the wire, earning 10 points on the Road to the Kentucky Derby in the process. Magnificent McCool shot to the front and sped through early fractions of :23.67 and :46.55 for the opening four furlongs on the sloppy, sealed oval with Mucho Gusto in close attendance. Mucho Gusto ranged up to the early leader when reaching six furlongs in 1:10.51 and readily took command under Joe Talamo. The Mucho Macho Man colt left little doubt, thereafter, spurting clear inside the final furlong in completing the 1 1/16-mile feature in 1:41.81 for Baffert. The 3-5 favorite paid $3.20, $2.20 and $2.10 for his tally. Gunmetal Gray, the 8-5 second choice, rallied from last to garner place honors and give back $2.40 and $2.10. Easy Shot was third, 2 1/4 lengths clear of his Magnificent McCool. 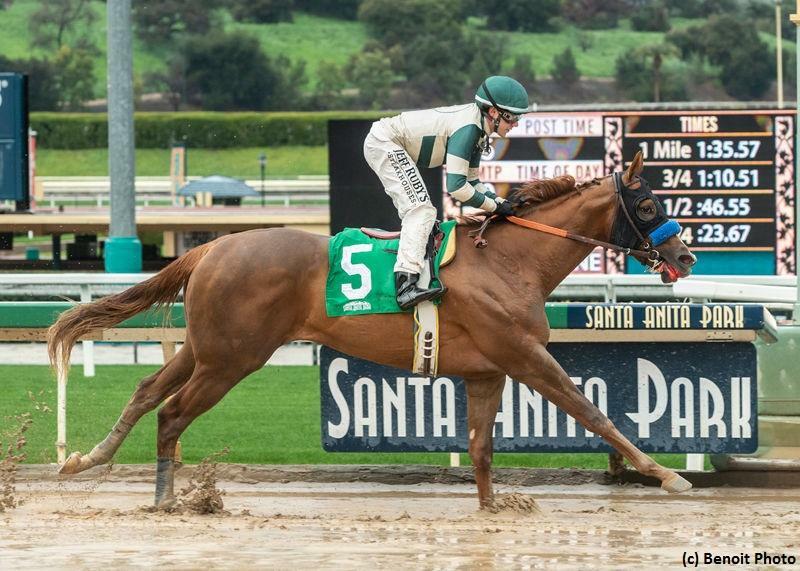 Mucho Gusto is now a dual stakes winner following his coup in the 2018 Bob Hope Stakes (G3) at Del Mar. The Grade 1-placed three-year-old sports a career mark of 4-3-1-0, $234,000. He finished second in the Los Alamitos Futurity (G1) in his 2018 finale to stablemate Improbable . The winner was bred in the Bluegrass State by Teneri Farm Inc. and Bernardo Alvarez Calderon. He went through the sales ring on four occasions, finally bringing a hefty bid of $625,000 at the 2018 Fasig-Tipton Midlantic Two-Year-Old in Training Sale. Mucho Gusto is the first foal out of the winning Giant’s Causeway mare Itsagiantcauseway. He hails from the same family as Canadian Horse of the Year Peaks and Valleys as well as multiple Grade 2-winning millionaire Alternation. Itsagiantcauseway has also produced an unnamed yearling colt by Jack Milton.